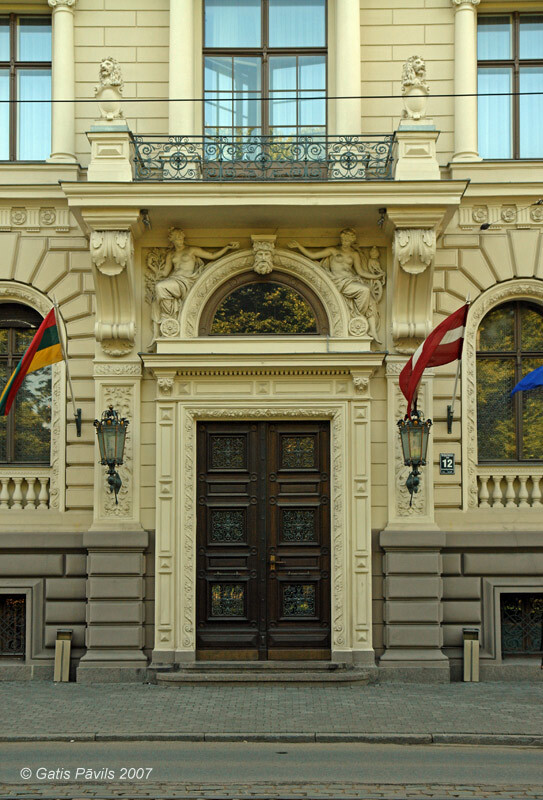 It is possible that no other building of Riga embodies the spirit of Italian Rennaisance as much as House of Benjamins. The shape of the building resembles Italian "palazzo" and its owners were rich, influential and loved arts. This enormous villa in its essense is like palace. The house is built in 1876 for the family if rich merchants Pfabs, designed by german architects from Berlin. In these times Pfabs owned many properties including storehouses near Central market, Dannenstern house. After some time the luck turned away and in 1928 Pfabs could not sustain the building. t was sold to family of Benjamins and later - in 1939 - Pfabs repatriated to Germany. the new owners were Antons and Emilija Benjamins - the most influential people of Latvia at time, owners of mass media empire. 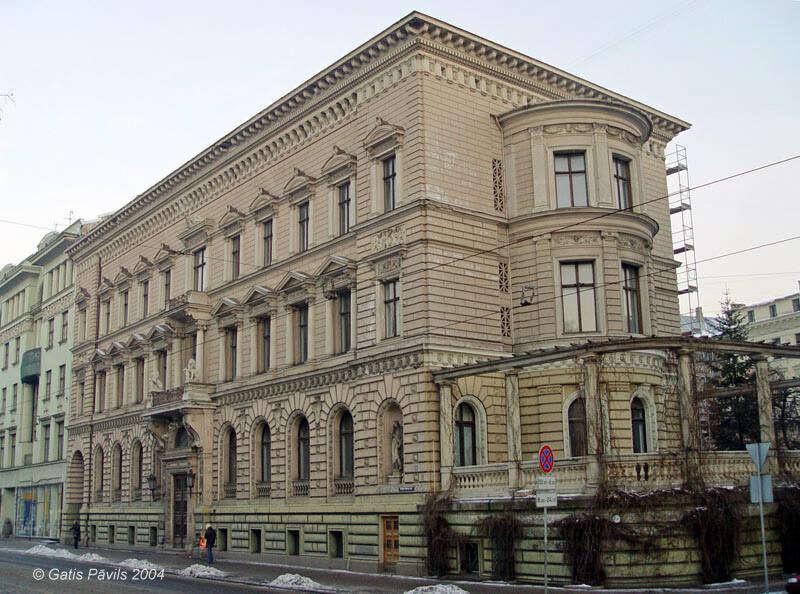 House of Benjamins became more ornate and there was performed recosntruction until 1930, architect - E.Laube. Numerous valuable artworks were placed here and in the salon of Benjamins there performed numerous popular artists. As there started Soviet occupation, Benjamins family fell into disfavour to the new power. Emilija was exiled to Soberia and died from hunger there soon. The house was natonalised and in 1945 there started to operate the Union of Writers, Composers and Artists. After some time this union united freethinkers under occupation regime (of course - open expression of their attitude was impossible), there often took place public events. In 1990ies the house was inherited by posterity of Benjamins. 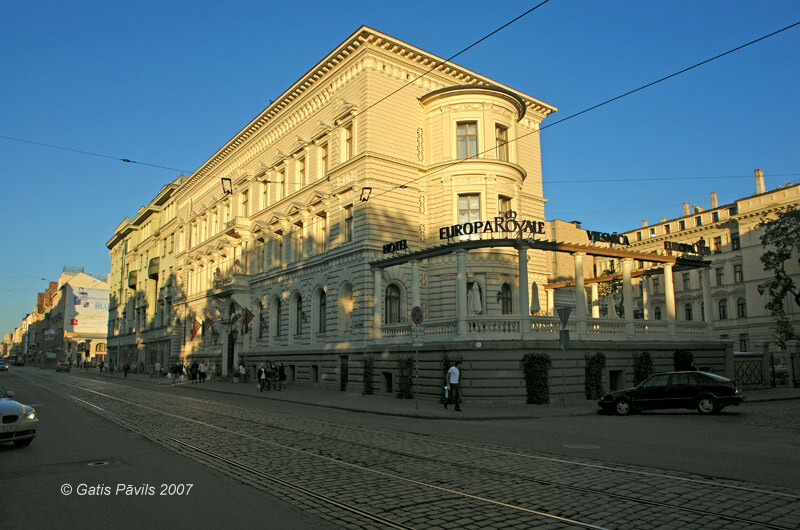 In 2006 the building was restored and there was opened hotel "Europa Royale". The house is shaped in massive Neo-rennaisance form. Facade of the building is adorned with sculptures and reliefs of the young sculptor August Voltz who was specially invited from Germany. He stayed in Riga and later has created numerous beautiful sculptures adorning numerous buildings in Riga. 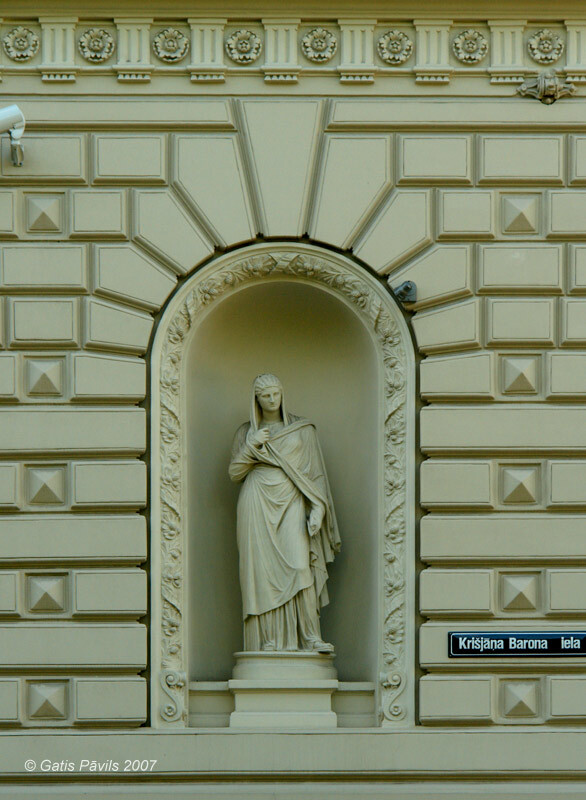 Voltz shaped sculpture of vestale in the alcove of the facade - keeper of hearth as well as scculptures of two girls above the entrance door. One of these girls holds spinning-wheel with sedge of linen - it was basis for wealth of Pfabs. The shield of balcony is held by two lions - it designates the self-assurance of the family. Ornate interiors of 7 rooms are monuments of art, there are several beautiful glassworks including the magnificent glassworks of K.Brencens - "Palace of Light" and "Lacplesis". House of Benjamins before reconstruction. 2004.11.04. House of Benjamins, entrance. 2007.08.01. House of Benjamins, sculpture of vestale. 2007.08.01. Krastiņš J. Eklektisms Rīgas arhitektūrā, Rīga, 1988, p.168. Petrovs A. Nams Barona ielā 12, Vides Vēstis - 1998/8, p.12 - 13.